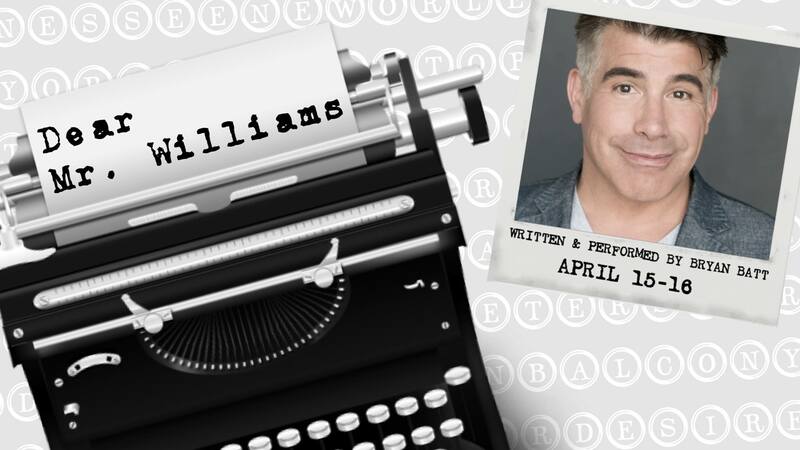 Don't miss Bryan Batt in "Dear Mr. Williams" on April 15-16 at 7:30p. The tumultuous - and sometimes treacherous - journey from adolescence to adulthood is one we all must take, but this one-man tour de force proves that it's so much more fascinating and fun with Tennessee Williams as your guide. Conceived, written, and performed by Bryan Batt, SAG Award winner ("Mad Men") and Drama Desk Award nominee (Broadway's Sunset Boulevard, Cats); directed by Michael Wilson, Drama Desk and Outer Critics Circle Award winner (The Orphans' Home Cycle).